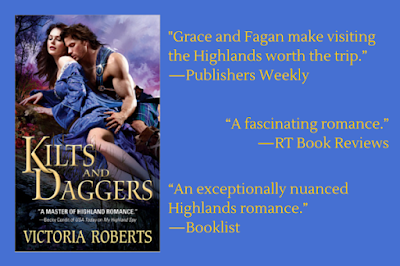 To celebrate the release of KILTS AND DAGGERS, the second title in Victoria Roberts’ Highland Spies series, Fagan Murray, the strong and handsome captain of Laird Sutherland’s guard has agreed to sit down with us and answer our questions so you can know more about this rugged Highlander! What’s the oddest location you’ve ever shared a kiss? When Grace’s eyes smoldered, Fagan knew he shouldn’t get too close to the flame for fear of getting burned. There was still enough time to take his leave. Otherwise, he’d be verbally sparring with a lass in the middle of the great hall. Ruairi would no doubt have his head for causing mischief with his kin so soon after the wedding. Fagan slapped both hands on the table and casually stood. Instinctively, he took another step back in case the lass suddenly had a strong urge to reach across the table and throttle him—or worse. Nevertheless, once she heard what he was about to say, the table wouldn’t provide enough space between them. “Verra well then. I think bhana-phrionnsa suits ye quite nicely.” When Grace’s cheeks turned scarlet, Fagan smiled. “Donna say I didnae warn ye. Remember I did give ye a choice.” He winked at her and then turned on his heel. Grace flew to her feet, walked around the table, and closed the distance between them. She lifted her head, and by the way she was unsteady on her feet, he swore the daft lass was standing on the tips of her toes in a futile attempt to look him level in the eye. 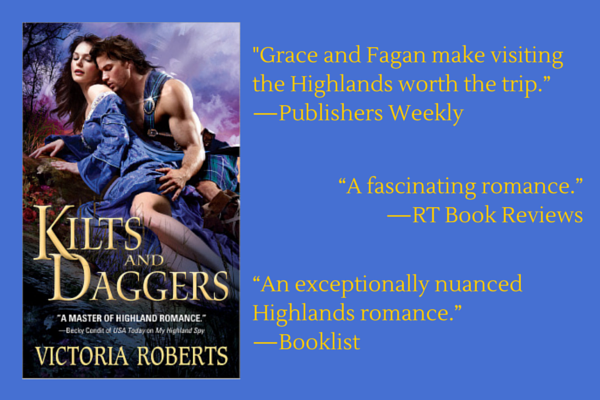 “England and Scotland have been warring for centuries, Mister Murray, yet somehow Scotland has never won.” Lifting her skirts, she brushed his arm with her shoulder and took a few steps away from him. That was until he called after her and stopped her dead in her tracks. “Cuine a chì mi a-ris thu, Grace?” When will I see you again? He made certain he said the words as though he spoke to his lover, which obviously had the desired effect because her whole body stiffened, and then she left him without a backward glance. Fagan’s mood was suddenly buoyant. He wasn’t exactly sure why he loved to unnerve Princess Grace, but he had one hell of a time doing it. This post contains affiliate links. To find out more click here.